Houses were evacuated and road closures put in place. 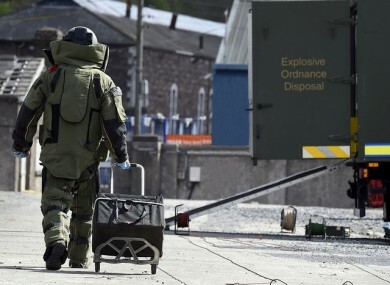 AN ARMY BOMB disposal team were called to a house in Kildare today to make safe a pipe bomb left at a house. The team rendered the improvised explosive device (IED) safe this morning in the Bothar Buí area of Athy in the early hours. The bomb was found at a house in the area. A cordon and road closures were put in place for public safety and a number of nearby houses were evacuated. The team arrived on scene at 1.30am and the device was made safe without the need for controlled explosion. It was then taken to a secure military location for further examination, where it was later confirmed as viable. The Defence Forces say that evidence will be handed over to the gardaí to assist them with their investigation. Email “Bomb squad called out after pipe bomb left outside house”. Feedback on “Bomb squad called out after pipe bomb left outside house”.